The GirlGuidesCANblog “Big Deal Seal” is Here! Help us recognize and celebrate our top bloggers! Since launching in 2011, GirlGuidesCANblog has flourished to become the heart of online Guiding, receiving amazing contributions from over 50 guest bloggers. To-date we’ve had 190 posts, with 62,602 views from visitors all across Canada and the US, Europe, Australia, Asia, South America and Africa! 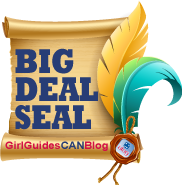 We’re launching the GirlGuidesCANblog Big Deal Seal to recognize and celebrate our top guest bloggers whose posts over the last year have inspired, engaged, enraged, enlightened and entertained us most, helping to make GirlGuidesCANblog a success! Winners of GirlGuidesCANblog Big Deal Seal will be awarded an online seal for their post on our GirlGuidesCANblog and that could also be used on their own blog or website. Read our nominees’ posts and tell us your favourites in each category. In order to vote, you must be a subscriber to GirlGuidesCANblog prior to and during the voting period. Subscribe to our blog. Vote by emailing your top choice in each category to submissions @ girlguides.ca. One vote per category per email subscription to GirlGuidesCANblog. For complete rules and regulations, visit GirlGuidesCANblog Big Deal Seal rules & regulations. GirlGuidesCANblog Big Deal Seal winners will be announced on June 1, 2012 on GirlGuidesCANblog. Bustin’ a Century Year Old Girl Guide Myth by Sarah L.
I Camp Therefore I Have My Camp Blanket by Sarah L.
Resolutions for the Happy, Healthy Guider by Sarah L.
Why Every Brownie Should Have a Camp Blanket by Sarah L.
Why I Plan on Being Guider Extraordinaire by Chantal S.
Princess Industrial Complex by Sarah L.
Sexualization. What Does Your Outfit Say About You. By Amy Harman, LMFT. Category 4: Oh My Guides! Girl Guides and Girls Scouts: A Sweet Comparison by Samantha F.
Please choose any post on GirlGuidesCANblog May 1, 2011-April 30, 2012, whether or not it appears on the top 25 list. Please do not include posts written by GGC staff. Just copy and paste the voting form below into an email, and include the complete title of your favourite post and author as it appears on the top 25 list, for each of the 5 Big Deal Seal categories! Email submissions @ girlguides.ca with the word vote in the email subject line. Please ensure you are emailing us your submission form from the email account you subscribe to GirlGuidesCANblog. * While our inaugural year runs February 22, 2011 – February 21, 2012, we did not include the posts from the first two months since they were primarily staff contributions, and our tracking system was not accurate. ** To vote in the Reader’s Choice category, run a search on the blog for any post that sticks out in your mind as the best! You can also skim through our top 25 list, or through the menu categories for other posts based on that theme.